Gabrielle Upton, NSW State Member for Vaucluse has visited Jewish House as it celebrate its refurbishment and recognises the NSW Government’s contribution to the costs. Centred in Bondi, Jewish House provides emergency accommodation, counseling, and related support services to the wider community. Jewish House received grants in 2009 and 2010 totaling $119,300 under the NSW Government Community Building Partnership Program to upgrade crisis accommodation facilities and fit-out new counseling rooms. 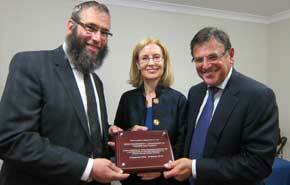 Ms Upton said that the refurbishment shows the commitment of Jewish House and its CEO, Rabbi Mendel Kastel. She said: “It was a great privilege to be invited by Rabbi Kastel to unveil a plaque and to celebrate the achievements of Jewish House over a quarter of a century. The funding provided by the NSW Government is testament to the tireless efforts of Rabbi Kastel and the valuable contribution that Jewish House has made to the Vaucluse Electorate and the broader Eastern Suburbs community. By providing a wide range of services to support community members dealing with issues such as addiction, depression and violence, Jewish House showcases the best of humanity and is a leading example of how well the community can help each other,” said Ms Upton. A special dedication of a plaque was also made in memory of the late Mannie Gold, who left a substantial bequest to further the work of Jewish House. A little known fact is the contribution the Jewish community has made over the decades. When Mary Mckillop was excomunicated and put out of her convent, they gave her and her sisters a roof over their heads. When Sr of Charity, the indomitable Fabian Elliott couldn’t raise money from the church for the hospital she founded, it was the Jewish community with Henry Bolte who made it possible. A little history on the side. Little did anyone know at that time, what pressure was placed upon her by the Archbishop of the day, to expand the maternity ward for women “in situations created by clergy” stuggling to maintain their vows of celibacy/chastity, still utilized into the 1980’s. A deliberate? slip of the tongue by renowned and highly respected independant journalist and former Lord Mayor of Melbourne, Peter Costigan.